The email arrived as we traveled home from a Thanksgiving visit in Ohio. 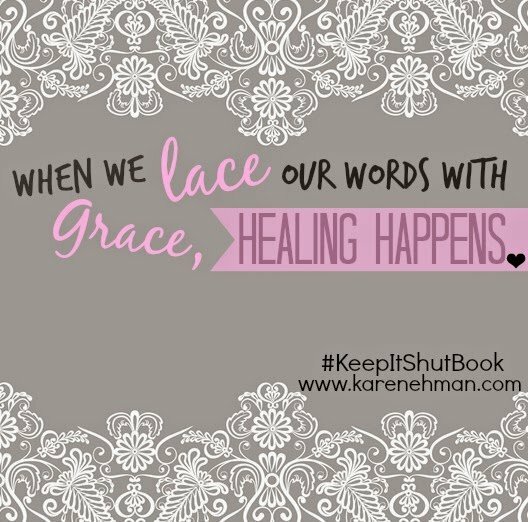 The first 100 responders would be a part of Karen Ehman’s Street Team for the launch of her new book, Keep It Shut. The Street Team was made up of regular gals like myself who would take to social media to “get the word out on the streets” that her book was launching. And so we did…go to the streets. The streets of Pinterest, Facebook, and Twitter were filled with posts, pins, and tweets about Keep It Shut. In fact, you might have seen some of the creative graphics they supplied posted on my wall and boards…often. This book was a life-changer for me, so I wasn’t shy about touting it loud and clear on social media. Keep It Shut launched earlier this week. It’s available! And the good news? Proverbs 31 is offering an upcoming Bible study for Karen’s book as well. You can sign up for the study here. Lord, will I ever get these words right? Why can’t I seem to speak clearly or even nicely when I’m upset? Why can’t I find the words when the time is now? Then Keep It Shut arrived. It oozes with encouragement from Daniel (yes, the lion’s den survivor himself), Karen’s life stories, and from the multiple Scriptures and quotes listed. Thank You, Jesus. Oh, and go ahead. Print those neat little Scripture and quote cards in the back. They’re ni-ice. ~ Apologizing to our children for our words, and minding our own sin. Karen attacked them, and they hit home. ~ Did you know that honey’s flavor varies according to the bees intake? I’d rather deposit sweet Spirit-inspired honey than bring a sting with my words. And you? ~ Lacing our words with grace. That’s where we’ll find healing. Truly. Are your words in step with God’s? Are you confident with them, knowing they are Holy Spirit inspired? Is there an area that needs a little sweetener for your words? If yes is your guess, then Keep It Shut is a viable option. It’s available here*, at Proverbs 31, and in other locations now. Awww…thanks Crystal. 🙂 It’s pretty nifty that we were both on the Street Team. I hope you enjoyed it as much as I did.